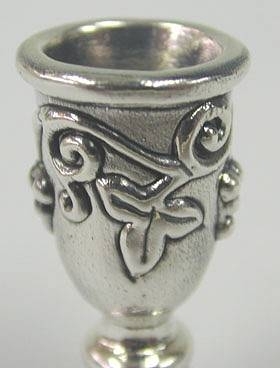 Sterling silver goblet miniature An adorable artisan Sterling silver goblet miniature. 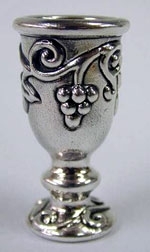 Highly sought after by collectors this miniature wine goblet has a delicate scrolling pattern on its round base, and around its body encircle vines with a cluster of grapes on each side of the goblet. This item was made in the electroforming method. Measurements: Height: 1.55in. / 3.93cm. Weight: 8.6gr. / 0.27oz. Marks: 925 for sterling silver.